After nearly a month without news it was good to get the mail today. 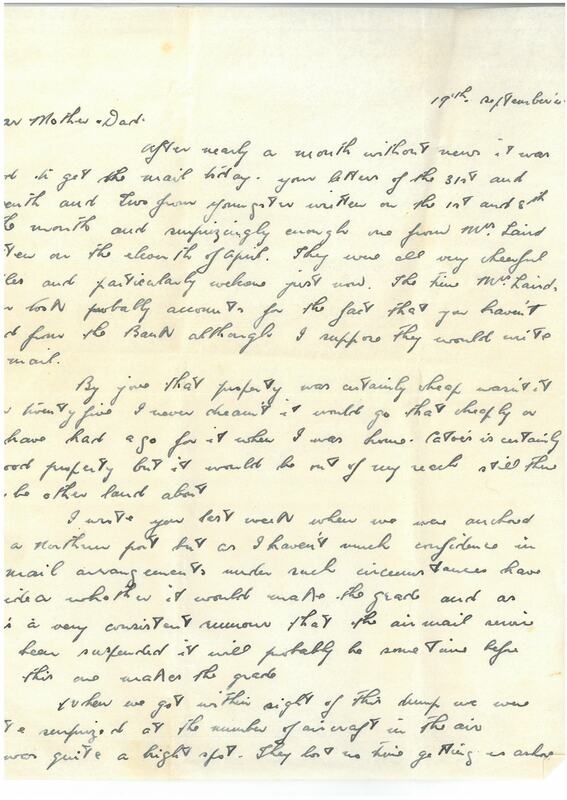 Your letters of the 31st and seventh and two from Youngster written on the 1st and 8th of the month and surprisingly enough one from Mrs Laird written on the eleventh of April. They were all very cheerful epistles and particularly welcome just now. 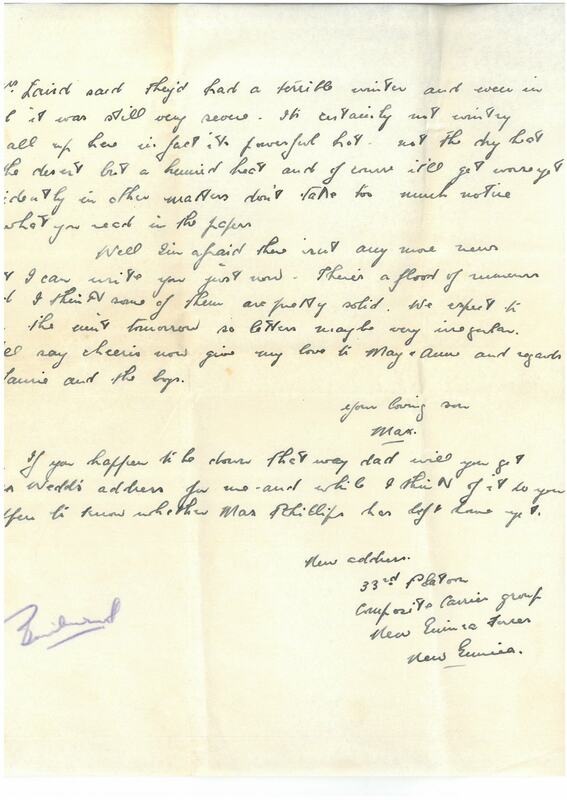 The time Mrs Laird’s letter took probably accounts for the fact that you haven’t heard from the Bank although I suppose they would write air mail. By jove that property was certainly cheap wasn’t it. From twenty five I never dreamt it would go that cheaply or I’d have had a go for it when I was home. Catoes is certainly a good property but it would be out of my reach. Still there may be other land about. I wrote you last week when we were anchored off a northern port but as I haven’t much confidence in the mail arrangements under such circumstances have no idea whether it would make the grade and as there’s a very consistent rumour that the airmail service has been suspended it will probably be some time before this one makes the grade. When we got within sight of this dump we were quite surprised at the number of aircraft in the air. It was quite a bright spot. They lost no time getting us ashore and into a makeshift camp where we had a meal of bully & biscuits and curled up for the night. Just to remind us that there’s a war on, the Japs put on a small scale raid early in the evening and all night the drone of our planes filled the air but didn’t disturb our sleep unduly. Whilst awaiting orders yesterday some of the chaps did a bit of reccy and acquired a case of beer which worked out nearly two bottles per man for the mob. Beer is a much sought after commodity in these parts, in fact to all intents and purposes this country is a temperance stronghold. But canteen prices for dry stuff are very reasonable. Of course once we get away from the canteen everything will be as scarce as gold but tobacco is 1/2 a two ounce tin and cigarette papers a penny a packet. Most of our bunch (the crowd who were left behind) made provision against being caught as they have always been caught before and went to amazing extremes to procure tobacco at 2/6 a tin. Still even at that it was good insurance to a smoker. Four of us – Ned Turner, Snow Lewis, Harry Cassells and myself – located a shower which turned out to belong to an airforce crowd. They’re not airmen but something to do with the business – a good crowd of blokes – they invited us to dinner and we lairized with plates etc and tables. Quite a good meal too compared with army standards. We got the only news we’d had for a fortnight from what they call the ‘good guts sheet’, a printed page of foolscap distributed by the airforce. 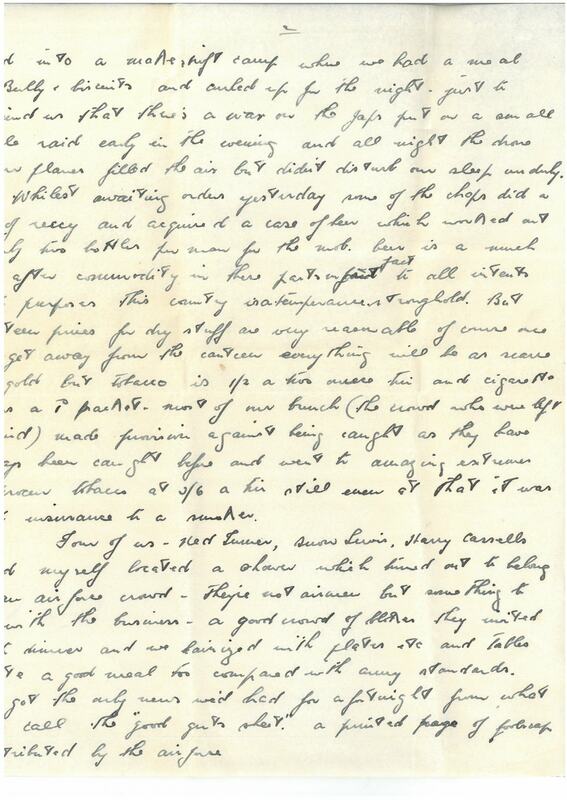 Mrs Laird said they’d had a terrible winter and even in April it was still very severe. It’s certainly not wintery at all up here. In fact it’s powerful hot. Not the dry heat of the desert but a humid heat and of course it’ll get worse yet. Incidentally in other matters don’t take too much notice of what you read in the papers. Well I’m afraid there isn’t any more news that I can write you just now. There’s a flood of rumours and I think some of them are pretty solid. We expect to join the unit tomorrow so letters may be very irregular. I’ll say cheerio now. Give my love to May & Anne and regards to Laurie and the boys. PS If you happen to be down that way Dad will you get Rex Wedd’s address for me, and while I think of it do you happen to know whether Max Phillips has left home yet? I have no idea how many men were on the ship, but it was very crowded. They had quite a few decks and we were right down on a lower deck and you just slept on the bare floor or on the hammocks. You were allocated a place to sleep and swinging above you was a hammock to accommodate double the quantity of men. As we went down the stairs to that deck it had a sign above our heads at the bottom of the stairs ‘Cattle Deck’. We were on the ship for three days in a convoy of 7 ships. The journey doesn’t normally take that long but in convoys during wartime their speed is governed by the slowest ship in the convoy and we had one that could only do 4 knots. We were guarded by a warship called a corvette and overhead from daylight to dark, a Catalina aircraft flew over, for spotting enemy submarines. During the voyage there was a submarine scare. The Catalina circled the warship and waggled its wings. The Corvette turned around very sharply and raced slightly to the rear and both the Catalina and the warship fired many depth charges. The result of this we will never know. We were never told any results of this action. 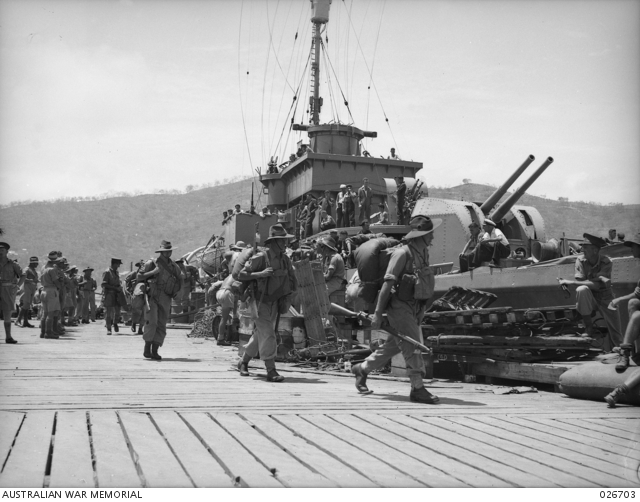 Image – AWM 026703 – Troops of the 25th Australian Infantry Brigade disembarking at the wharf from naval corvettes, having been ferried by those from troopships anchored in the harbour. The destruction at the Seven Mile airstrip was a disaster for the men of the 2/14th Battalion who had set off along the track in mid August and first engaged the Japanese at Isurava on August 26. They were relying on supplies being dropped at Myola – but the bombing of the transport planes at Seven Mile meant none arrived. Image AWM 026271. 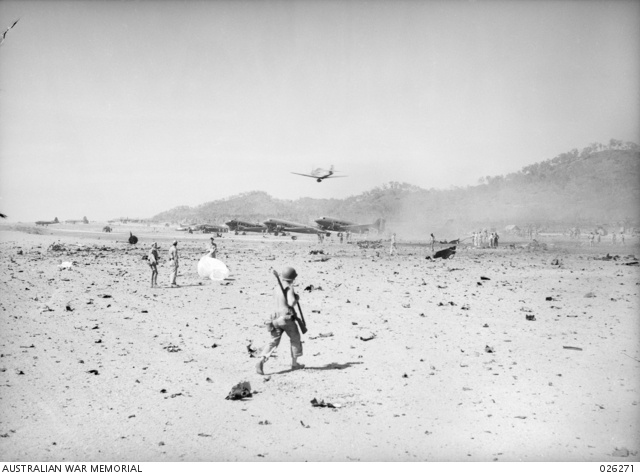 Papua 18 August 1942 View of Seven Mile aerodrome near Port Moresby after a raid by 24 Japanese bombers. The casualties were one killed and thirteen injured. Four planes were destroyed and several damaged. In the picture are several transport planes which should have been dispersed. 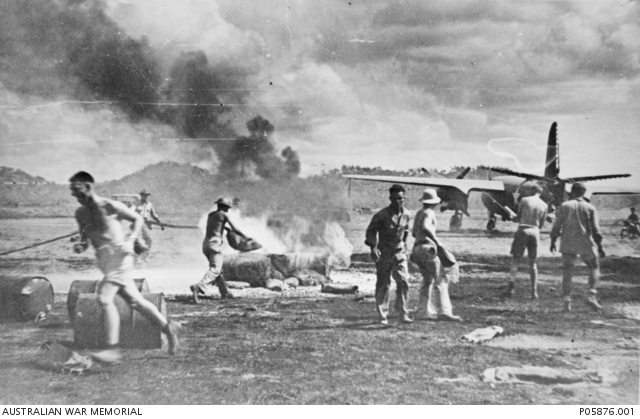 Bomb damage at Seven Mile Aerodrome near Port Moresby following a Japanese air raid. 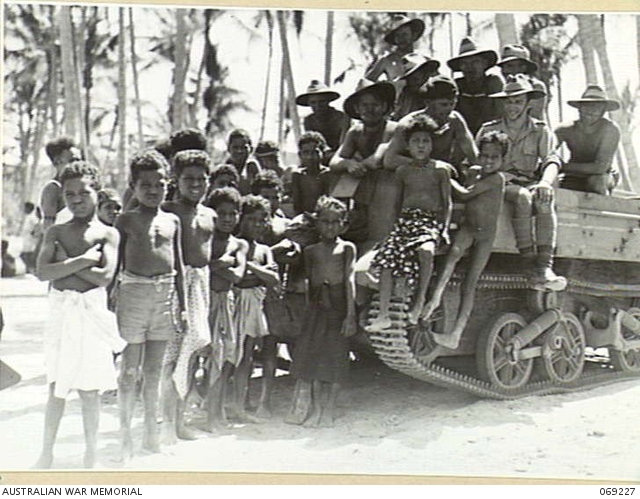 Native children taking a keen interest in a Bren gun carrier, manned by Australian troops who were present as a cover patrol during the visit of Major General B M Morris, DSO…. This entry was posted in Carrier platoon, escapades, relaxation, fun and games, Food and Drink and tagged Moresby Army News Sheet. Bookmark the permalink.